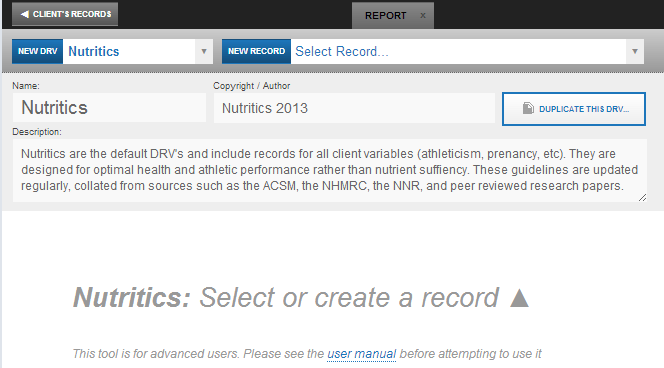 Nutritics allows you to set custom Dietary Reference Values which will be displayed visually on the report. This ‘power feature’ allows you to set nutrient targets as precise intakes, as calculations based on body weight (or other formula based targets) or as an acceptable distribution range. You can also define lower and upper limits for any nutrient. 2. Name the DRV and provide a reference or author and description if desired. 3. Rename the DRV, author, and description as desired. 4. Select the record you wish to edit from the drop down at the top right (The field “Select Record” in the example above”). This will import the existing values into the tables which can now be edited. Add a ^ symbol (shift + 6) after the recommendation to include a lower limit. Use basic calculator notation (addition +, multiplication *, subtraction -, division /) and nutrient keywords to program advanced formulae. Acceptable keywords include weight, age, bodyfat, lbm (lean body mass), bmi, eer (recommended kcal intake) and pal. These are based on data from the client information panel (panels 2 and 3). Take note they are all lower case. You can also use any nutrient in a formula by typing it in the box exactly as it appears in the DRV editor (all lower case). 4 is the number of calories per gram of protein, this converts 20% of calories to grams. 8. Fat intake is a range from 20-35% of kcal intake and an upper limit of 40% of kcals. Please contact support@nutritics.com if you require assistance setting up custom Dietary Reference Values.